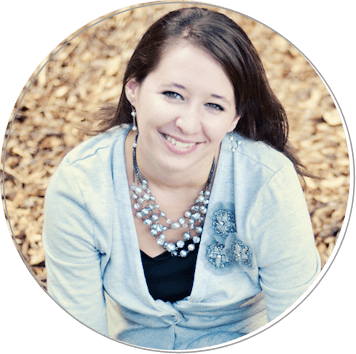 I am so excited to have a guest blogger today! Jessica, is my real-life friend AND blog friend and today she has a wonderful recipe whipped up to share with you. She blogs at Jesstagirl and Her Officer and also at The Tale of Two Kitchens where she and her sister-in-law post tons of delicious recipes. Her recipe today is very easy and even better it has LOTS of garlic! I hope you enjoy! Hello, Singing Through the Rain readers! When Kathryn asked me to share a recipe I knew exactly what to pass along! Typically, we (my sister-in-law and I) like to create or tweak recipes for The Tale of Two Kitchens, but the one I’m sharing with you is straight out of a recipe book. I bet you’re wondering why I’m giving you a recipe that’s already out been made; I mean, that’s not very creative of me, right? Well, I figure people enjoy finding different recipes to make for dinner, and even though this one isn’t exactly “new,” it may be new to you! With only five ingredients, this recipe is simplicity at its best, and it’s mouthwatering delicious…if you like garlic. And if you don’t like garlic, I urge you to give it a second (or third, or fifth, or tenth) chance. Yes, it calls for 40 cloves of garlic, but with such a long cooking time, the garlic becomes creamy, fragrant, and sweet instead of pungent, spicy, and raw. And the chicken—oh, the chicken—it’s so juicy that it literally falls off the bone. Serve this with some homemade French bread and good company! 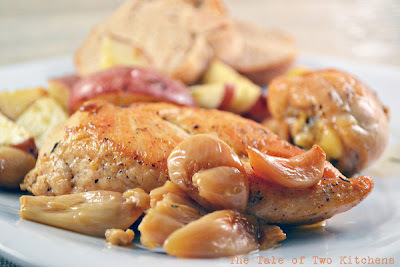 Don’t forget to come check out some other tasty, easy, and husband-approved recipes over at The Tale of Two Kitchens! Season the chicken all over with salt and pepper. coat chicken pieces on all sides with 2 tablespoons of oil. In a 12-inch, straight-sided oven safe saute pan* over high heat, cook the chicken for 5 to 7 minutes per side, until nicely browned. Remove pan from heat; add remaining 1/2 cup oil, thyme, and garlic cloves. Remove pan from oven; set aside for 15 minutes with the lid on. Serve family style with plenty of bread to spread the softened, fragrant garlic on. Previous Post: « My First Vlog… About Vlogging! My family loves garlic … I'll have to try this this weekend! Thanks, Jess! how long does the chicken bake? I'm your newest follower. I invite you to visit my blog and follow me if you want too. @Katz76, sorry about that, I missed a vital step of the recipe! The chicken and garlic bake for 1 1/2 hours! Mmmm… *stomach grumbles* I'm a sucker for anything that calls to be served with lots of fresh, crusty bread! But boy that is a LOT of garlic! How long does the garlic breath last for? !